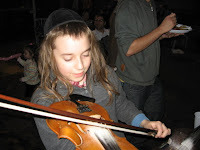 It's the Jewish holdiday season, and today I was called to play a Sukkot celebration in Budapest. 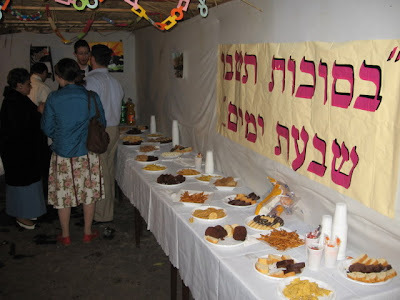 Sukkot, or sikkes as we would say on my part of the Ashkenazic bloc, is the annual Harvest feast, the festival of eating in tents, and after the serious business of Rosh Hashonah and Yom Kippur, it serves as the first of the "happy holdidays" for kids. The Orthodox Jewish school in the 7th district set up a sukkot tent and hired a magician for the kids, while the parents wandered about being... well... orthodox. After playing I always let the kids play with my fiddle. 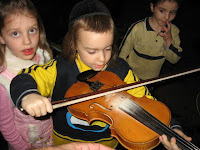 This is where you have the ultra orthodox Jews of tomorrow playing the fiddles of today. At this age, they are just absolutely normal kids ... OK, with big payess, but as curious as kids can be and they are being raised in a rather protective environment - it must be hard to grow up in a country where the political opposition press has nothing better to do besides spout anti-semitic garbage all day. And you are the lone hasidic seven year old. It has to have an effect on a kid, although if you are from an ultra-ortho family, you probably don't spend very much time glued to the TV watching secular local politics. 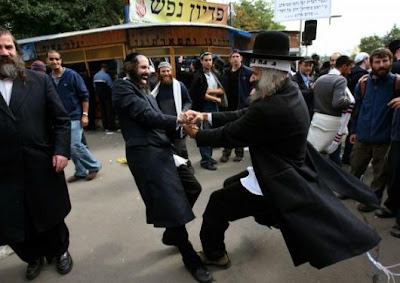 As a musician, it's kind of hard playing for the dancing at these events - most of the folks at this event are grounded in Israeli Litvakish tradition, and don't know much of the older Hungarian Vizhnitz, Satmar and Sighet music that we usually play, while we don't always know their Israeli modern melodies. But after a week of eating wonderfully non-kosher Romanian and Japanese food in Transylvania, you know that sooner or later the kosher kitchen has to catch up to you. You can't escape. 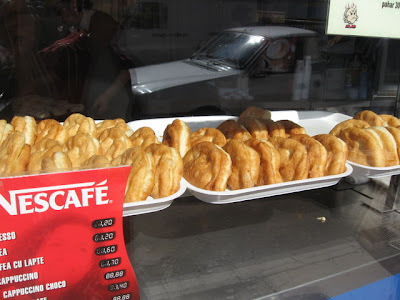 The Stodge Monster of Our Own Tribal Tradition awaits you. Ultimate Orthodox party chow. 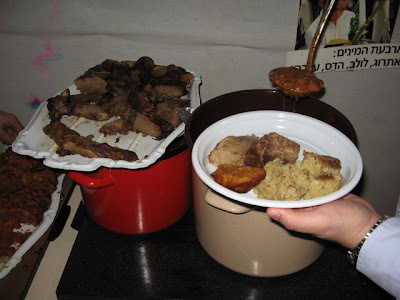 Roasted beef flanken, cholent beans, and at least two kinds of starchy stuffed kishke dishes. That's kishke stuffed in a goose neck with some kind of semolina stuffing, and a much heavier potato and onion stuffed kishke. Just so you can choose. Do you see any fresh vegetables? No, I don't seem to see any fresh vegetables. Oh well. There were cookies, however. But no fresh anything. Jews don't do fresh. Sorry. Since most of the congregation at this event spoke Hebrew and seemed to have stepped off the plane from Erets three minutes ago, how did they go from those light Israeli Mediterranean salads to heavy Ashkenazic stodge so quickly? After a hard day of photography in the Gypsy quarters of Transylvanian villages, Fumie gets hungry. And when Fumie gets hungry, she wants rice and fish. And when Fumie wants rice and fish, damn right, she gets it. In Cluj. I'm not kidding. 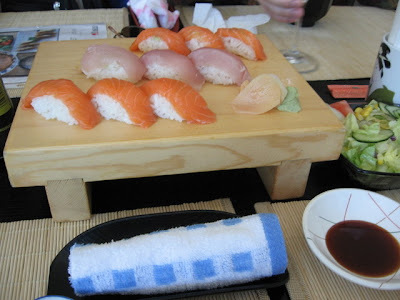 There is good sushi in Cluj. Who'da thunk? It's a cliche by now to marvel at the discovery of sushi restaurants in odd corners of the world, but finding a good slice of raw fish on rice in the middle of Cluj-Napoca (Hungarian name: Kolozsvar) the central city of Transylvania in Romania takes the prize. The Tokyo Restuarant is on a hilly street near the upscale Zorilor neighborhood, and after a week or so of mamaliga cu brinza and smoked meat, Fumie needs her rice fix and it is time for a trip to the sushi bar. 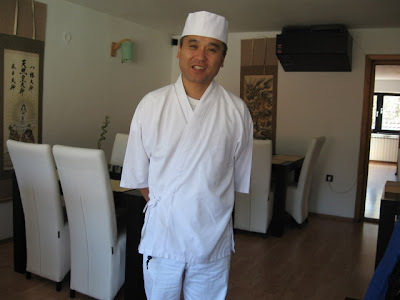 Fumie first learned of the place by reading the Japanese langauge blog of its owner, Mr. Tsuchiya Naofumie, a Tokyo chef who married a Romanian girl and moved to Cluj with her. Needless to say Mrs. Tokyo Restaurant speaks flawless Japanese, while Chef Nao has a pretty good handle on Romanian. And if you are just off the plane from Osaka, you can relax at the bar while NHK Japanese TV plays softly in the background. 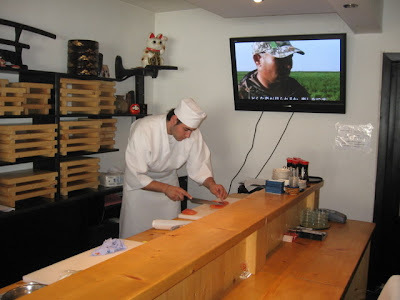 Chef Nao - with amazing effort - has managed to source fresh ocean fish for the restaurants sushi menu. No, you won't worry that carp is being served here... it is fresh tuna, salmon, and mackeral, better than sushi in most western European countries. Fumie even suspected the wasabi was ground fresh, something you won't find even in many pricey sushi bars in the west. 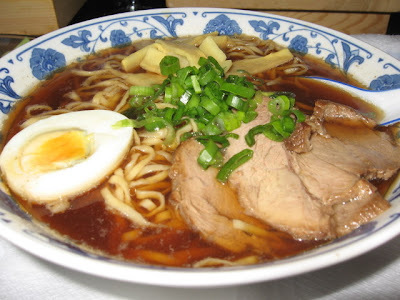 On this trip Fumie was chasing after Edo-centric of obsessions: a good bowl of ramen noodles. 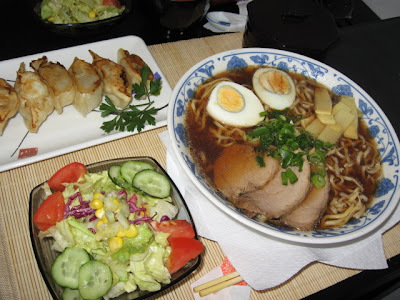 In Europe it is pretty rare to get a decent bowl of ramen that doesn't come from a plastic bag. The secret is in the noodle making. 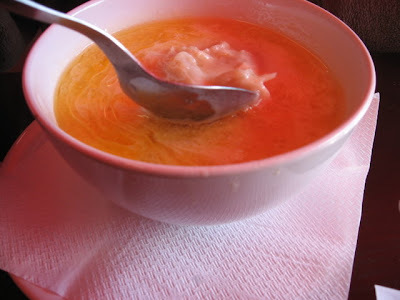 Now, home made noodles are a common item on Transylvanian tables, so why not make your own? Which is exactly what Chef Nao did, hiring on his Mother-in-law and some of her friends out in a nearby village to do the noodle kneading. The result is fantastic. 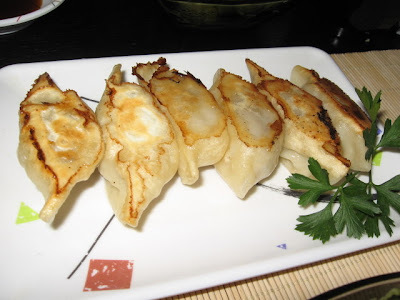 Served as a set lunch with a salad and a serving of gyoza (the dumpling skins are also makde by the Transylvanian aunties) sets you back about EU 6. 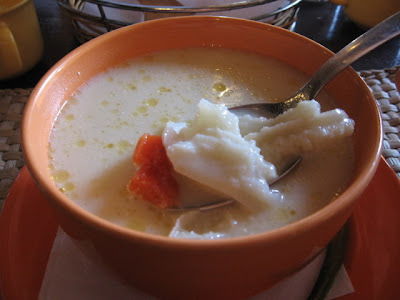 And, true to Transylvanian cuisine, the serving is big enough that only a Transylvanian could possibly finish it. 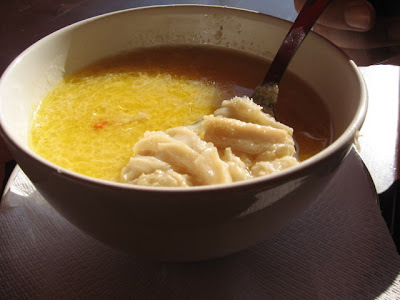 Having a Transylvanian village full of in-laws churning out fresh noodles and gyoza skins means Chef Nao may start distributing on a regional basis soon. He has taken the next step in making Romania a far, far better place in which to eat lunch. 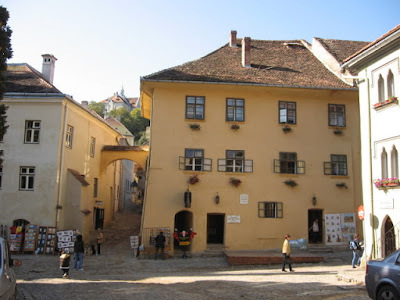 Afterwards we hiked down hill towards our lodgings, amidst familiar Transylvanian town images... burping up wasabi and still amazed at the incongruity. 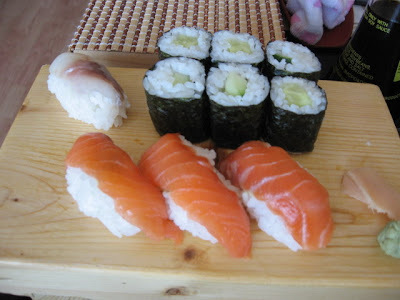 Good sushi in Transylvania. When I was kid growing up in the Bronx I used to get a magazine called "Boy's Life" the official publication of the Boy Scouts of America. 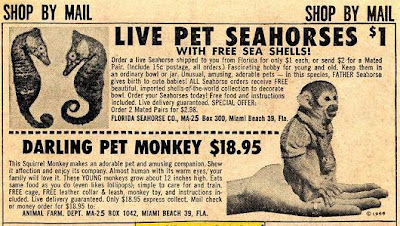 Back in those days there used to be an advertisement in the back section that caught my attention: you used to be able to order live squirrel monkeys via the post. These little fellows would get tossed into a box with an apple and some monkey chow, sent through the mail system, and somehow arrive at your doorstep alive, and presumably, happy to see you. "Live Delivery Guaranteed!" Of course, every ten year old in the Bronx wanted one, myself included, but I have never met anybody who actually owned one of these pet monkeys. At that time, $18.95 was considered a lot of money. But still - I have never met anybody who actually ordered a monkey from the Boy Scout magazine. Now, Monkeys are about the worst pets one can own - apart from the cruelty of owning primates as pets, squirrel monkeys are social animals who need to live in groups, not to mention that they wash themselves in their own urine. But of course, when you are ten, you don't worry about these things. In those days, advertising aimed at ten year old boys was direct and effective... Yes! Yes! We all want pet baby raccoons! And by some mysterious power, no parent alive on the face of the earth ever allowed any of us to get one. Thus we were denied the valuable experince of watching our pet baby raccoons grow up to be vicious, wild, rabies carrying monsters with no experience of domestication at all. I was talking about these pet ads with some buddies of mine the other day... and nobody knew of anybody who ever actually got one. Now, there are a lot of strange folks in the world who like to own monkeys and raccoons and such as pets... but even in those unenlightened days it was considered a dark rarity. But it doesn't end there... did anybody actually ever order one of these: Damn. 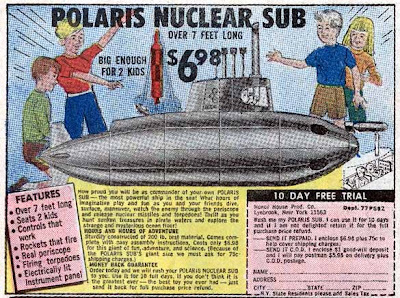 Your own Polaris Nuclear submarine. With a 10 day free trial! Who wouldn't want one of these. I could have sailed down the East River and wiped Brooklyn off the map with one of these. In any case... 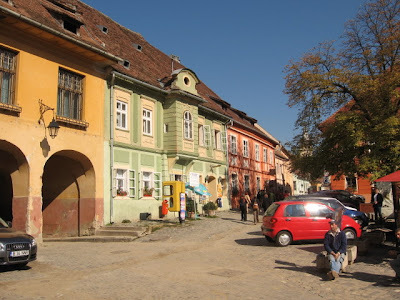 I'm doing a concert in Transylvania, be back next week. 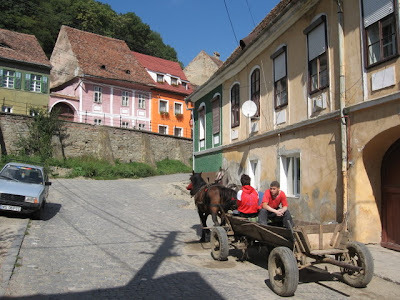 I’ve noticed that some visitors have arrived at this blog by googling for the Negreni Fair (AKA the Fekete Tó vásár in Hungarian) which is coming up in October in the Transylvanian village of Negreni, in Bihor County, Romanian. Negreni was in the news last week, sadly, when a truck barreling down the main road in the rain swerved and hit a funeral procession, killing five people. Possibly the first time the BBC ever took notice of Negreni. The Negreni Fair is one of the last great peasant fairs in east Europe, and while a lot of these events have become folklorized tourist attractions, Negreni continues in all its grimy, smoky backcountry capitalist glory. It takes place on the second weekend of October each year, which means that it should be October 13-14th in 2007. 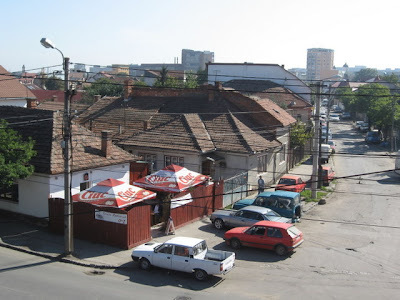 If you expect to stay nearby, book your motels in Cluj or Oradea now – they tend to fill up weeks in advance. 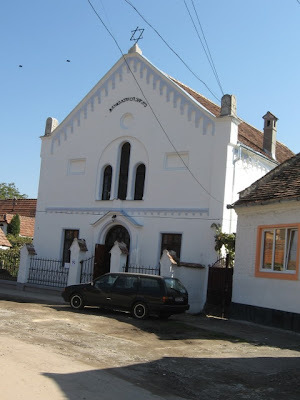 The easiest way to get to Negreni is by car – local families rent parking space in their yards – or by train – the early morning local trains running between Cluj and Oradea will stop in Negreni for the fair, but check to see when the afternoon trains are running back to the cities – there are not too many. 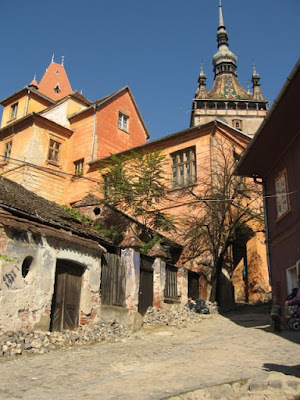 The sellers at Negreni are a mix of local Transylvanian Romanian, Hungarian, and Gypsy, and you hear a mix of all these languages spoken simultaneously, a true Tower of Babelescu. 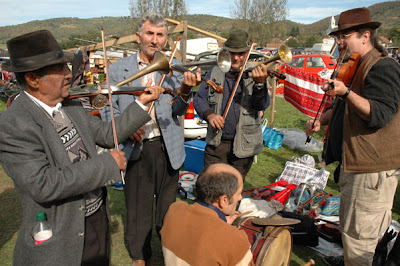 For the local Bihor Romanians – a hardy mountaineers who still wear long sheepskin cloaks and play the vioara cu goarne (resonator trumpet or stroh fiddle) – the fair is the annual reunion event, with much palinca din Bihor drunk, and massive vioara cu goarne jams. A lot of folks write to me asking about how to get these fiddles. Well, it ain’t easy. You can get them at the Bucharest Village Museum shop, or at the Pro Folk Music shop at Almassy ter in Budapest. Or you can go to Negreni. The man to see is Dorel Kordoban, from the village of Lazuri in Comuna Rosia near Beius (directions here.) Another maker is Mircea Rostas from the village of Bratca, which is closer to the Oradea-Cluj highway. Mircea also makes fine instruments but likes to paint them in garish sparkle paint, whereas Dorel's instruments are finished in natural wood. Shopping? Well, there are great hats -kucsma - made from fetal lamb skin – yes, lamb fetuses provide the softest fleece for hats. You get the lamb fetuses by slaughtering the mothers for mici, those indelicately turdy meat sausages sold everywhere at the fair. Few hats can claim a back story comparable to that. 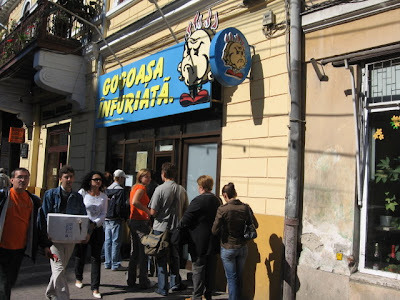 It’s called hasi bárány in Hungarian “belly lamb” and it is not a hat for vegetarians or very sensitive people. 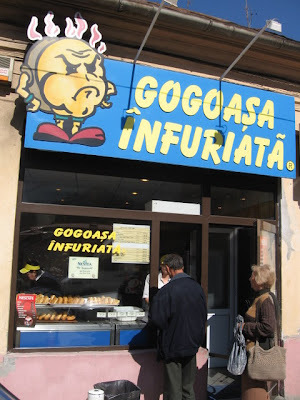 But Romania is the kind of place where you can walk around with a horror story on your head and nobody thinks twice. Nice hat! Transylvanians are known for eating huge portions of meat and potatoes, and so of course you need a cauldron for cooking, and luckily there is an entire ethnic group ready to serve you, the Kalderash Gypsies, whose name originates in their occupation of making and repairing cauldrons (caldera.) What a wok is to Chinese cuisine, a cauldron is to Transylvanian cooking. 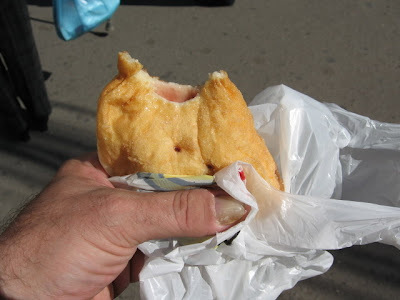 Transylvanian cuisine is rather easy to duplicate. Simply take a normal Romanian recipe for stuffed cabbage sarmale, for example, and proceed to quadruple the amount so that each serving provides at least a kilo per person. To be safe, double that. You now have a distinctly Transylvanian portion of food. A lot of foreign antique dealers go to the fair and if you know the difference between antiques and junk you can find a lot of good stuff here. As for myself, I almost never buy anything. But the junk is magnificent. Unfortunately I can't make it to the Fair this year, as I will be playing music in New York that weekend. 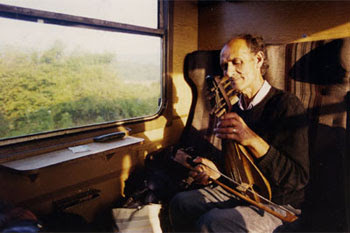 Finally... heading back to Oradea from the fair with Dorel and Florica last year, even after a very long day and a few too many palincas, there's always time for a tune on the train. L'Shona tova y'all...it's Rosh Hashonah, which means New Years to all of us who fall somewhat in the Jewish line. Rosh Hashanah extends over the first two days of the Hebrew month of Tishrei, and is actually one of four "New Years" and by the Jewish count, it is now the year 5768, and today also marks the beginning of Ramadan. Both holidays involve eating sweets (among Muslims, sweets and special delicacies break the daytime fast) to ensure a sweet future. 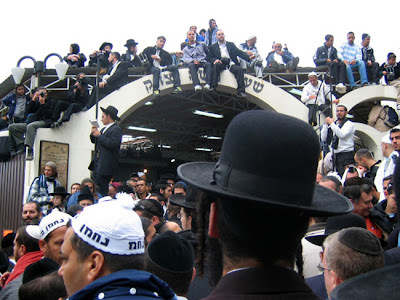 There are lots of traditions that mark the celebration of Rosh Hashanah, but my favorite is the annual pilgrimage of thousands of Breslov Hasids to the Ukrainian city of Uman, where the grave of Rabbi Nachamn of Breslov is located. 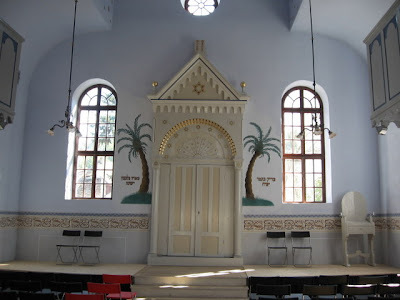 When Rebbe Nachman died, he told his followers: "Whoever comes to my gravesite and recites the Ten Psalms of the Tikkun K'lali, and gives even as little as a penny to charity for my sake, then, no matter how serious his sins may be, I will do everything in my power -- spanning the length and breadth of Creation -- to cleanse and protect him. By his very payess (sidelocks) I will pull him out of Gehenna (purgatory)!" 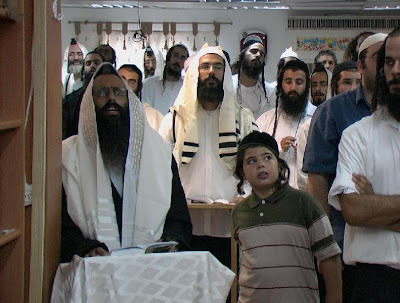 [photo from The Forward] The Breslovers are one of the less insular hassidic sects, and while they are, naturally, strict in observing the Torah they have a reputation for outreach towards "penitants" - non-orthodox Jews seeking to return to the fold of orthodoxy. Unlike Chabad-Lubavitch, which focuses on strict torah learning and the practice of mitzvahs, Breslov teachings stress the value of mysticism and meditation. These are the Hassids you can see dancing on the rooftops of vans in Brooklyn in white yarmulkes covering their long, thick, wild payess sidelocks. 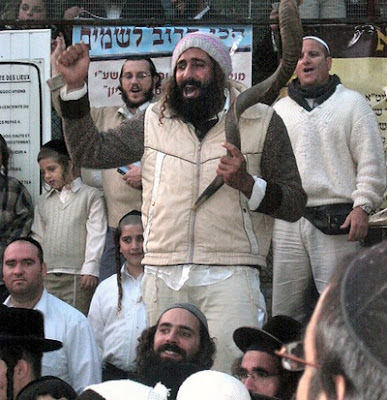 With their stress on the mystical benefits of spending an hour a day dancing and meditating in forests, Breslov are the Grateful Dead Hippies of hassidism. Breslov is wildly popular among young people in Israel, especially those who were not raised in hassidic tradition, especially Sefardic Israelis. Unlike most Hassidic hoyfn, Breslov do not follow a dynastic line of rabbis descended from their founder, Rabbi Nachman, claiming that When Rebbe Nachman died in 1810, instead of appointing a new rebbe, his followers continued to look to him as “the Rebbe.” In this sense Rebbe Nachman is still the leader of the Breslover Hassidim. Where other Hassidic groups have a chief "rebbe" the Breslover's have... Rebbe Nachman's chair. Needles to say, the pilgrimage to Rebbe Nachman's ohel in Uman is not without problems. The huge kosher outdoor kitchens have to serve 20,000 devout Jews, and a lot of them get food poisoning. People sleep in tents in the parking lots behind the Breslov offices. Greedy cab drivers try to rip them off. But still they come, hoping to be pulled out of hell by their sidelocks. 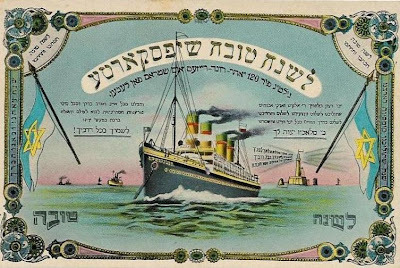 On the other hand, the Breslovers have a great musical tradition, since Rebbe Nachman himself composed many exquisite niggun melodies that are still sung. The ascension of Bulgaria and Romania into the EU this year has resulted in some major cultural changes, most of them positive, especially if you are a bear. In July the last dancing bears in Bulgaria were bought from their owners and “retired” to a bear reserve in the Rila mountains. While fans of cute toothless bears rejoice I personally wonder about the fate of the families that led the bears. 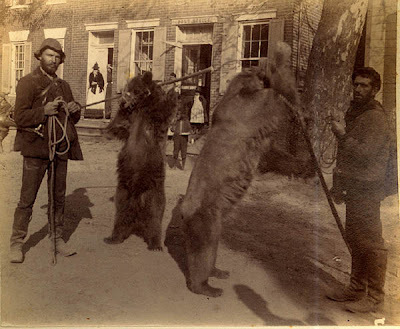 To be sure, the bears were not models of proper pet care. 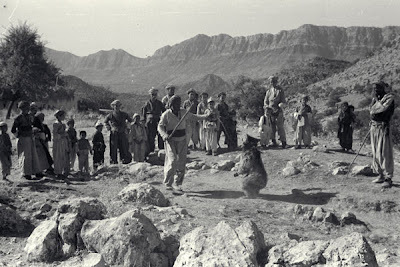 They often had their teeth pulled, were malnourished, and were taught to neurotically “dance” by making the cubs stand on hot coals while music played, strikingly similar to the training of Wal-Mart employees. Leading dancing bears had been a part of Balkan culture with roots going back to early Byzantine times, when bear leading Gypsies were a regulated guild in Constantinople. Dancing animals were required for Imperial processions. This was Byzantium, remember, where foreign policy practice often meant hanging ambassadors upside down over smokey fires before poking their eyes out. My how times have changed! Leading dancing bears is still widely practiced in India and it may have been brought to Europe by the migration of the Roma towards Europe from India sometime before the first millennium AD. 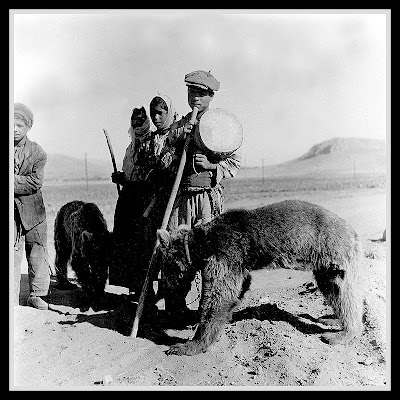 Most of the bear leaders working in Bulgaria and in Istanbul were Romanian speaking Gypsies who lived in the east central hills of Thrace. These were Ursarii Gypsies, and they didn’t refer to themselves as Roma but as Romanii (Romanians) having lost the use of the Romani (Gypsy) language. 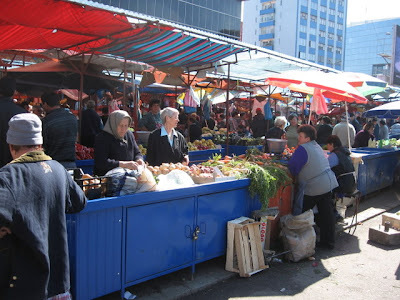 In Romania proper the Ursarii still speak Romani and refer to themselves as Richinari. Nobody has led dancing bears in Romania for years, but the musical tradition of the Ursarii is maintained by Napoleon Constantin and the Shukar Collective, which is a world music collaboration between some Bucharest DJs and the Ursarii family that featured on the Taraf des Haidouks’ Dumbala, Dumba CD. 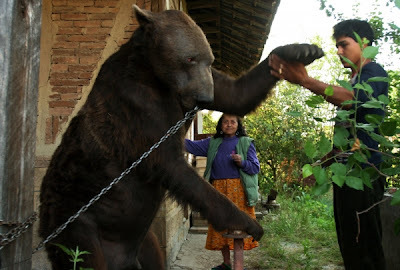 Bear leading was banned in Turkey about ten years ago and about the only place it survived was in Bulgaria. 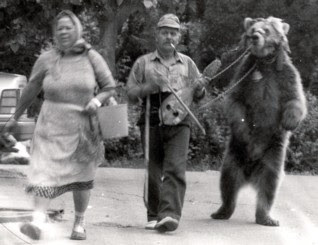 During the summers Ursarii would bring their bears to the to the Black Sea resort towns like Varna and Balchik hoping to scoop some change from tourists taking photos of the dancing bears. 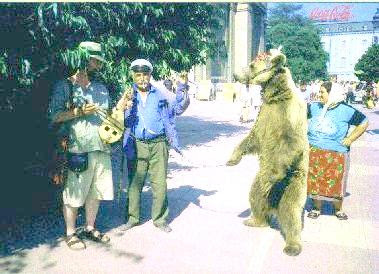 Often an Ursar would lead his bear right into a café and people would throw money just to get the beast away from them. I mean, think about it... A trendy sidewalk café. A 350 kilo Carpathian brown bear. It works on so many levels. 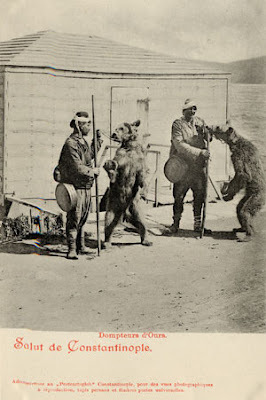 In Romania the bears danced to songs accompanied by drumming and wooden spoon percussion. In Bulgaria, however, bear dance music was always accompanied by the gadulka, a pear shaped fiddle with as many as twelve sympathetic strings which give the instrument a shimmering, ethereal sound. 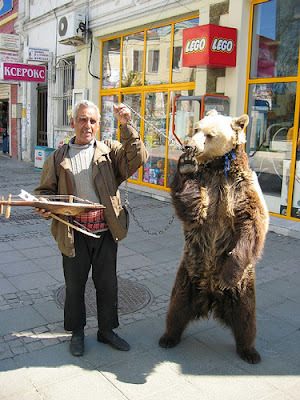 I dabbled a bit in bear leading about five years ago while traveling in Bulgaria. 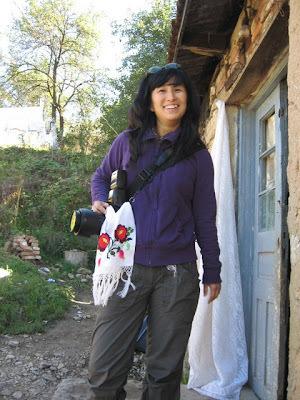 Everybody has a little “extreme sport” story somewhere – the time I bungee jumped or the time I parachuted on a dare. Mine is playing for the dancing bear. 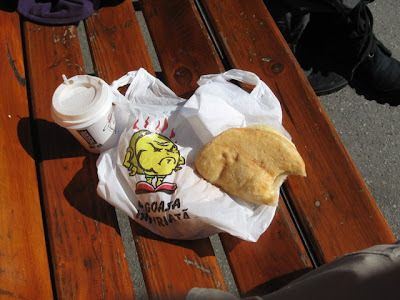 I was traveling from Ruse to Varna by train and had met a couple who were carrying a gadulka. 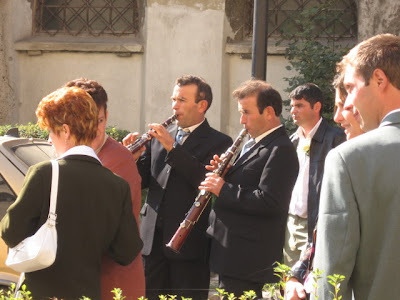 They spoke Romanian and were going to play street music along the beach in Varna. Dimitru, the gadular, had sold his bear to the western bear protection agents and was now seeking to make a living… without a bear. We sat in the same compartment and Dimitru played for hours, and later in Varna I met them on the street and asked how business was. “Terrible. You have to have a bear.” The other alternative is a monkey, usually a rhesus obtained from a university lab. Monkeys are a definite step down from bears, and they are usually old and neither cute nor happy. 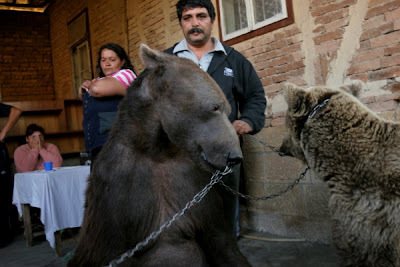 And they really don’t dance well, compared to bears, causing their owners to fling them around by their chains while trying to play the gadulka. I saw one monkey actually break his owner’s gadulka bow. Dimitru’s competition in Varna had a monkey which would terrorize café patrons, snarling and pinching at their dresses and pants legs and showing off his pathetic little moneky thing until someone paid the gadulka player to get the horrible little primate away from them. Bears don't behave like this. Bears have a sense of dignity. In a whole day of bearless street playng, Dimitru had made about four Euros. “It doesn’t work without a bear.” Based on my own experiences with hip European café life, I suggested he try an act involving a dancing poodle… or maybe a parrot… but no. “It has to be a bear.” A few days later I saw another bear leader in downtown Varna… Fumie wanted to take a picture, but the bear leader’s wife wanted money. I was just interested in the gadulka, so when the bear approached I said in Romanian “Nu vine cu ursul!” (Don’t come with the bear!) “Are you a journalist” “No. I’m a musician.” Suddenly I was something they could understand, and this thing spoke Romanian… so the bear leader handed me his gadulka. And the the bear started coming towards me… so I played. And the bear stopped and began swaying. Finally, I had a truly captive audience. The end of bear dance leading in the Balkans, however, is tragic in its own way. What happens to the Gypsies who lived from bear leading? Most are given a few thousand Euros to hand in their bears and the press is told that they can use this money for job training, but to this day I have never seen an Ursar who has actually completed a course in computer networking systems… It seems a sort of historical watershed has been reached. 2007. The Year the Dancing Bears Vanished.